It is now clear that the world has less than 11 years to switch away from fossil fuels to avoid the worst impacts of climate change (see IPCC report here). In response to this on 5 December 2018 Frome Town Council declared a climate emergency and committed to going carbon neutral by 2030. The Councillors also unanimously agreed to sign up to the Covenant of Mayors to track progress and link with towns around the world who are cutting emissions. As well as helping to raise the profile of this vital issue and secure external support and funding, reducing energy use and switching to clean energy will also increase energy security, improve air quality, minimise fuel poverty, boost the local economy and provide jobs and training. 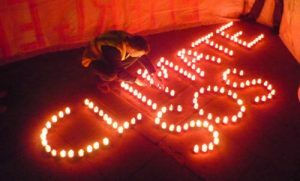 If you would like to declare a climate emergency in your town feel free to adapt Frome Town Council’s Climate Emergency paper, Climate Emergency presentation and Zero Carbon tool. And see ideas below which you might be able to do in your area too. See the map showing local governments that have declared a Climate Emergency here. Here are some ideas that we are trying in Frome. Any decision to do something similar in your area is at your own discretion. Or do drop us a line to find out more. Commercial Offer: companies such as Green Nation can install free solar on commercial roofs and offer building users a signficant discount. Frome plans to launch this offer in May 2019. Community energy: if there is a community energy organisation in your area find out more about what they are doing and see if they can provide free community owned solar panels on local buildings – this works particularly well on community focused organisations such as Medical Practices and sports clubs. Cut carbon at local schools: encourage local schools to sign up to Energy Sparks: – it’s free to join and provides real time information on energy including out of hours, as well as curriculum led activities to help reduce costs and carbon. Electric charge points: Zero Carbon World can provide free chargers on commercial and community buildings (but don’t cover installation or metering). Raw Charging can provide EV charge points for free in areas where usage will be high. Raw Charging cover all costs, users pay via their phone or card and Raw do a profit share once utilisation has reached a certain point. Car club: talk to car club providers such as Co-Wheels (who are a social enterprise), about having hybrid vehicles available for hire, one car club car displaces around ten privately owned vehicles on average and are often lower emission too. New developments: if there are large developments planned in your area it might be worth talking to the Microgrid Foundry. They work in partnership with community energy organsations to install solar, batteries and a microgrid to maximise renewable generation on site.